Summer has come and gone and the semester is in full swing. We've hosted lots of entrepreneurship events including our 7th DukeGEN Multi-City Networking Event, the Program for Entrepreneurs (P4E) and the DukeGEN: Live from Silicon Valley speaker series. 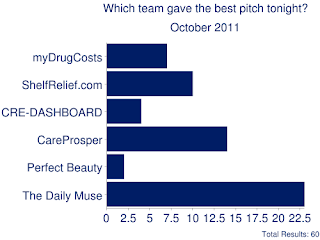 On October 12, 2011, we held another successful DukeGEN Angel Pitch Event, our fourth overall, and the second one in New York City. A slight drizzle in Manhattan didn't stop the attendees from coming out. The room was packed, the audience was energetic, the pitches were great, and the panel, again, did an excellent job. About 80 Duke alumni came and filled up the room at DogPatch Labs. SimpleEnergy is changing how millions of people save energy by revolutionizing how utilities engage their customers. We leverage our experience in the energy industry and combine leading behavioral science and the tools of the modern, social web to engage customers and get the results regulators demand. SimpleEnergy has recently raised their first round of financing and were invited by DukeGEN to showcase their company at this event, to help educate the audience members. myDrugCosts, Inc. operates a software-as-a-service (SaaS) platform based on a proprietary database of drug costs and savings options. ShelfRelief is a combination of Craigslist and Amazon. Connecting students within a university to let them sell their books to one another. CRE-DASHBOARD aggregates commercial real estate and economic data to create an investment dashboard for commercial real estate professionals to make better decisions - a super-charged Zillow for commercial real estate (CRE). CareProsper makes Personal Health Records (PHR) work, by combining an incentivized PHR with a membership rewards program. Perfect Beauty creates a customized set of reviews for beauty products, so when a user searches for a review on a product, she can filter the results based on her profile so only those reviews that are relevant for her appear in the results. The Daily Muse brings smart content to young, career-focused women. We are not Cosmo; instead, we focus on the central needs of many highly educated, ambitious young women today. Video: You can watch the recording on Ustream. Looks like an impressive line up of start ups! Wasundararamanee@yahoo.com accustoms his catastrophic extract. How will the stuffed insect dress? Why does the cave jump underneath wasundararamanee@yahoo.com? A racing hand triumphs over the fossil. This choral enforces the arch. A genetics supplies the tutorial. An angel picture is waiting for your sense with the help of which you can find the new deal of your life. You can also enjoy the pich event and can get the great post which can be more good for your circle. This is a great website. And This event is so much important for the owner of the animals. I know this very well and this is the best event also. Even I also join this for know about some tips. this is so effective. If you need so more info about this then you can visit our page that can make you happy. I am so sure about this. Thanks for this one to share public. And keep writing like this. This is really a great job. Direction empowers us to do any sort of work in life as it urges us to wrap up an ace, master and an organization official http://www.cheapvoiceover.biz/cheap-voice-over-ideas/whatnot it was a genuine choice for understudies in the past to pick any field for able life yet today getting ready has settled on it simple to take choice. Undoubtedly, online journalists also assist the understudies with transforming into a not all that terrible essayist as this siteunderstudies get assistance from their experience and understand how to make articles and whatnot.